Extra Specifications: LAN(LXI), USB Host & Device, and GPIB. The Com-Power SPA-800 series is a high performance, low cost, easy to use, portable spectrum analyzer for EMI testing. It has a wide frequency range and low noise floor to enhance measurement range. Advanced, easy to use interface makes your work simple. The SPA-800 series offers you the greatest performance to price ratio in the market. 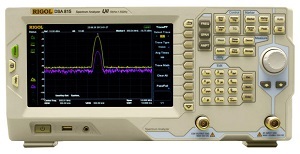 The SPA-800 series Spectrum Analyzers are extremely valuable for locating the EMI noise source on systems in order to meet various regulatory agency requirements. Its features and affordable price allows design engineers to use it to perform preliminary radiated and conducted EMI testing. User-oriented interface is design for easy operation of complex functions. A high-resolution 8" WVGA display provides high quality images. Traces are drawn in different colors, allowing recognition of small disparities at a glance. The SPA-800 series have complete connectivity including LAN(LXI), USB Host & Device, and GPIB.